Background: The patient symptom monitoring and management system (SMMS) is a secure web portal through which cancer patients’ symptoms are recorded and tracked. It incorporates ongoing assessment of patients’ symptoms, tailored information delivery, and automated symptom messaging to oncology nurses. This presentation describes issues and challenges in developing and evaluating the SMMS. Portal design, usability, security, and pilot testing with patients and healthcare providers will be discussed, and results of evaluation activities will be described. Methods: The patient-driven SMMS was developed at a major oncology center, then piloted with newly-diagnosed colon cancer patients (n = 12). Each week, over a period of eight weeks, patients recorded their cancer-related symptoms such as fatigue, nausea, numbness, pain, diarrhea, loss of appetite, and others (N = 103). Symptom severity was ranked on a 0 (not a problem) to 10 (interfered heavily with my lifestyle) scale (M = 4). Based on each week’s symptoms and related health management questions, the SMMS generated an evidence-based information Toolkit tailored to each patient’s symptoms and concerns. Results and Discussion: Development and evaluation activities are discussed, including web mining to identify patterns in testers’ symptoms and information behaviors. Individual-level and system-level data collected through portal activity logs included login time, time on-page, reported symptoms, and information resources used in support of symptom self-management. Data analysis has helped troubleshoot design and system interaction problems. Research findings are also used to improve the SMMS’s functionality, promoting more effective cancer symptom self-management support for patients. What it is: a web-based interactive system development and assessment. Cancer is no longer an acute disease. People are living with cancer for longer periods of time. Survivorship begins with diagnosis! Cancer survivors have significant needs. The cancer symptom management system created to meet these needs. It is multidisciplinary. It is designed as a database to log symptoms and manage information. Unique and complicated needs in a very difficult time. Provider and patient sign up together. Providers get dings when symptoms reach a threshold, but they can also sign in to track/trend their patients’ symptoms. There is also a piece for caregivers (family, etc. ), and this is the piece an insurance company bought. Various usability features modified as it was seen how the site was used. Caregivers are linked to the patient, particularly important where there is geographical distance. Looked at case trends, toolkit (which provides supplementary info) usage. Reading skills, health literacy are important. 1 patient was more engaged. They tried to figure out why, but it was difficult with the lack of information in the system. The next test will be modified to capture more behavior. How do symptoms drive useage patterns? How is the information toolkit used in decision making? System crash, had to be monitored. Michigan and Indiana are arguing about who owns what, who does what, publication rights. Developed various best practices around methodology, testing, developing structure, developing team, usability, funding. This evening a good time was had by all. The evening began with the Meet & Greet for mentors and mentees. Lots of great conversation. Then the action moved to the Exhibits area for the Welcome Reception with the vendors. There viagra online canadian pharmacy were sweet treats galore and door prize drawings. All good. For more fun conference photos, check out Flickr photos tagged midwestmla11. And watch for more photos! One of my places that I want to visit in Indianapolis but have not yet is the Kurt Vonnegut Memorial Library, opened last year. It is open daily (except Wednesday) 12pm-5pm and located at the “corner” of Senate, Indiana, and Vermont streets. From the hotel, walk towards downtown a block to Senate (the street where the capitol building is), then turn left (north) and go four blocks. It will be on your left. Welcome to Indianapolis! Conference 2011 is up and running! The CEs are in progress! We are looking forward this evening to the Welcome and Exhibitor’s safe to buy cialis online Reception. The program says that I will be able to indulge my sweet tooth. Sounds like an excellent idea! Author midwestmlaPosted on October 8, 2011 Categories Conferences & MeetingsTags conference, Indiana, Indianapolis, midwestmla11Leave a comment on And we’re under way! 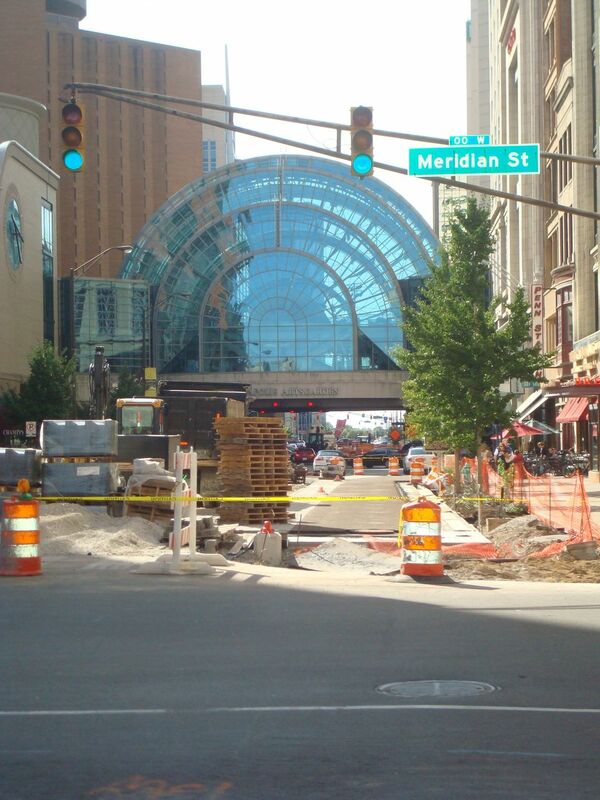 As much as I love the Cultural Trail in Indianapolis, it is not completed yet. The Super Bowl this upcoming February 6, 2012 is going be held here in Indianapolis, which means even more construction is under way to make the city its shiniest and prettiest for early next year. Bonus construction, coupled with a lot of one-way streets in downtown Indianapolis, makes driving extra fun (or headache-inducing). Also not surprisingly with construction, where to cross the street, which lane is open, etc. may change daily (or hourly). Drivers in Indianapolis, being in the Midwest, are generally still polite (read: not enough honking, in my opinion), so just keep that mind, and bring good walking shoes! Ah, Indianapolis. Indianapolis and Marriott seem to have a pretty good thing going. So good, though, that it can be a little confusing to figure out which Marriott is where you want to be. The Marriott you want: Indianapolis Downtown Marriott, 350 West Washington Street. This is the one closest to the Convention Center, next to the Westin, south of the Government Center. The JW Marriott (aka the big blue one): if you end up here, you are a block away from the actual Marriott you want. Head towards downtown (away from the river). On the other side of the Government Center Parking Garage will be the Indianapolis Downtown Marriott (where you want to be). Courtyard Indianapolis Downtown: this is on the west (river) side of the JW, immediately next to the JW. One of two Courtyards in downtown Indy. Fairfield Inn & Suites: next to the Courtyard above. Springhill Suites: also in the Marriott Place. Courtyard Indianapolis at the Capitol: the other Courtyard, in between New York & Vermont streets, about 3.5 blocks too far north. Residence Inn Indianapolis Downtown along the Canal: this does face directly onto the canal; again, still 3.5 blocks north of where you should be. I’ve included all of the names here so hopefully, if you end up at the wrong one, you will know either to head away from the river and towards downtown, or head south (towards Government buildings & parking garages). Good luck & see you soon! Oh, another tip–highly recommend getting to the hotel from West Street (there are exits off of I-65 and I-70 for West Street); there are a lot of one-way streets downtown and construction. Maryland is one-way east; Washington is one-way west; Missouri runs in between then and is two-way. Author midwestmlaPosted on October 6, 2011 Categories Conferences & MeetingsTags downtown Indy, midwestmla11Leave a comment on WHICH Marriott? Interested in roller derby? Always wanted to go, but were a bit nervous or not sure what to expect? Like the idea of watching other people with awesome nicknames try and push each other down while on roller skates? I’m sure there are more technical terms for what happens in roller derby, but I’ve only been to one bout–I do remember that term–and can’t remember any other lingo. The Monumental Mayhem, a roller derby tournament of the Top 10-ranked teams in the Women’s Flat Track Derby Association’s North Central region (thank you for the information, Indy Star), is happening at the Indianapolis Convention Center this weekend, across from our conference hotel! For those who have never been to a bout, I have to say that it’s a fun atmosphere, and roller derby is more than skating and shoving people. There is strategy involved, and the scoring was (to me) not intuitive; it was fun to figure out how the sport worked, cheer for your favorites, and daydream about what your roller derby name would be. As a fan of downtown Indy, I love to be able to introduce people to restaurants in Indy. Contrary to what I sometimes hear, Indianapolis DOES have a variety of one-of-a-kind locally-owned restaurants, as well as some unique restaurants with only a few locations nationally. Our restaurant guide represents a small portion of dining options available in the downtown area; if you have questions about particular ones, other ethnic cuisine options, etc., please leave me a comment, or stop by the Hospitality table at the conference! This is a great 2-page document with a map showing locations of many landmarks and restaurants in downtown Indy, as well as contact information for those places. I’m a visual person and seeing a location of something on a map is more helpful to me than only written directions.